Best buy | Tohatsu Brand | Tokyo Hatsujyo Manufacturing Co.,Ltd. From design to manufacturing, we take on the order in its entirety. We manage design, produce, inspect and package the product in its entirety. Minimizing time loss by manufacturing in this way, we have materialized improvements in production efficiency between sections' through teamwork. It is very hard to maximize efficiency if pieces are manufactured separately. Reviewing plans, reduces the number of uses. From design to manufacturing, we take on the order in its entirety. We are very happy to consult with our customers about parts or products you have already used to keep costs reduction. We will procure the best materials for domestic and foreign markets. Also, if you have ordered from another trader and Painted molding, for example, if you are completely separate, there is a possibility that can be a big cost saving. We search the best possibility match so as to reduce costs for our customers through our achievements we have been able to make the best products by utilizing our experiences. We suggest changing to use single springs from double. There are possibilities for expanding the spring's maintenance cycles by improving durability or heat resistance of the springs. Are you in trouble about springs? 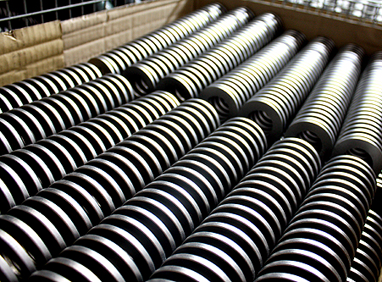 Do you need low quantity, small diameter, or long free length springs? If you are in trouble about springs, please contact us. You can get best solution.